tl;dr we’ve closed the separate Kima15 offer and application as it was causing too much confusion around what Kima Ventures does. We are still actively making new investments (more and faster than ever before) and companies can continue to apply for early-stage funding from $100,000 to $200,000, at flexible terms, with Kima leading or following, directly on our website. A few weeks ago, I was at a startup conference in Lisbon and was very pleased to see that Kima Ventures was well known amongst the attendees. However, I often found that they knew Kima for the Kima15 programme (our fixed offer of $150k for 15% in 15 days) and thought that was the only type of investment that Kima makes. By thinking that Kima15 was the only offer that Kima has, founders who were raising rounds larger than $150k or who were looking for valuations higher than $1m didn’t consider Kima as a potential target for their fundraising; thinking their round wouldn’t be relevant to Kima (even if in reality their rounds would have been a great fit for us). Since launching Kima15, we’ve tried (and failed) to make it clear that Kima Ventures invests $100,000 to $200,000 per company, at flexible terms in Seed or Series A rounds that we can lead or follow. And that we also have one fixed offer (Kima15) with fixed terms but that only makes up a very small part of our overall investment strategy. Still, the existence of this offer has still led to confusion. To avoid this confusion in the future, we’ve decided to close the separate Kima15 offer and stop accepting new Kima15 applications via AngelList. We’ll continue to invest early and often (you can see the current portfolio and even track our evaluation pipeline in real-time) but from now on will only accept applications via our website, all via the same form. Kima Ventures was founded in 2010 and in December 2013 we saw an underserved part of the early-stage fundraising market and launched Kima15; a separate programme that allowed startups to apply using their AngelList profiles to raise $150k from Kima Ventures for 15% of their company in 15 days (from application to funds received). We included a Service Level Agreement (SLA) stating what we promised to the applicants (to review every application, to give a decision within 5 days and closing the investment in 15 days) and published the term sheet (based on the Seedsummit terms) that we would use for each Kima15 investment with no changes or negotiation. We wanted to bring speed and transparency to a process that was, in general, slow and opaque. In total we received direct applications for the Kima15 offer from 3,177 startups (on average that’s 3.2 applications every day since going live 32 months ago). This shows that there is clear demand for quick funding at this valuation level (all companies were asked to confirm they accepted the terms to apply). I expect the numbers were partly driven by the simplicity of applying on AngelList using an existing profile and the promotion of the offer on AngelList but a lot of startups did actively seek out Kima15 and create profiles on the basis of the offer. While we don’t disclose which companies we have invested in using Kima15 (usually companies prefer to keep their valuation private) and don’t treat them any differently from any other investment, there are a handful of Kima15 companies that have gone on to raise significant Series A rounds and the paper value of our shares in these greatly outweighs the losses from the Kima15 companies that have since shut down. Given the low entry valuation of $1m, raising a Series A already provides a more significant multiple than had we invested at a typical seed round valuation. In a few cases, we used the Kima15 terms to invest in companies that didn’t explicitly apply for the offer. While seed investing typically uses standard terms anyways, having a fixed term sheet and valuation to refer to when we met a very early-stage company that we liked, made it even easier and faster to make an offer and close those investments rather than telling them to come back with more traction. There’s too little innovation in early-stage investing, too few funds are trying out new things. When Kima15 launched we received wide coverage (TechCrunch, Pando, Tech.eu, WSJ) and spurred discussion on sites like Hacker News. I believe we were the first VC fund to guarantee a response time and to offer an SLA. Parts of the Kima15 offer have since been emulated by other VC funds with more funds being transparent about their terms and processes. At launch our goal was to make “50 new investments in the next 12 months using the fixed Kima15 offer”, that didn’t happen. The actual numbers are nowhere near 50 investments per year (our total investment numbers are higher, just not via Kima15 offer alone). This was because, although we received a lot of applications, the quality of the applicants was low (or our expectations were too high) compared to the companies that applied via our website or got in touch via our network. Even at the $1m valuation, we found it difficult to justify investing $150k in many of the companies that applied and our application-to-funding percentage for the Kima15 channel was lower than for any other inbound channel. We decided on $150k for 15% ($1m post-money valuation) as $150k was already out standard cheque size and the valuation at the time seemed fair for a very early-stage company raising their first funding (and using “15” was catchy). This limited the ability for companies to raise a larger round as part of Kima15 (they were allowed to but it would lead to more dilution) meaning that they often had a too short a runway. The valuation on offer also led to more applications from geographies with less developed startup ecosystems (what might be a great valuation in Europe, might not be in San Francisco), automatically excluding companies at the same stage in more developed markets. The choice to structure as equity (rather than convertible debt) and considering investments in any jurisdiction also limited the flexibility and speed of closing due to added complexity of legal paperwork. Since then there has been much progress on standardising note documents (SAFE, KISS, AIR etc.) that could have been used to simplified the offer. The SLA promised “a decision within 5 working days of submitting your company via AngelList”, this was done by pulling each company into our CRM and having each of our team members vote on each company to decide if we should look at it further. In most cases where everyone voted “No”, the companies received fast responses within this time frame but often the companies where someone from the team voted “Yes” took more time to set up a call and make a decision; some much longer than 5 days. The intent was then to close the investment within 15 days, this invariably took longer; clean entities with standard structures in the US or France we could close in this time but anything more complex (existing shareholders, unusual jurisdiction etc.) would take much longer. As touched upon in the introduction, despite trying to make it clear in everything we said and wrote that Kima15 was only one offer that we have and most of our investments are made outside of this offer at flexible terms; people still understood that Kima15 was the only thing we did. Therefore founders who were raising larger rounds or who were looking for higher valuations didn’t consider Kima as a potential target for their fundraising; thinking it wasn’t relevant even if in reality their rounds would have been a good fit for us. 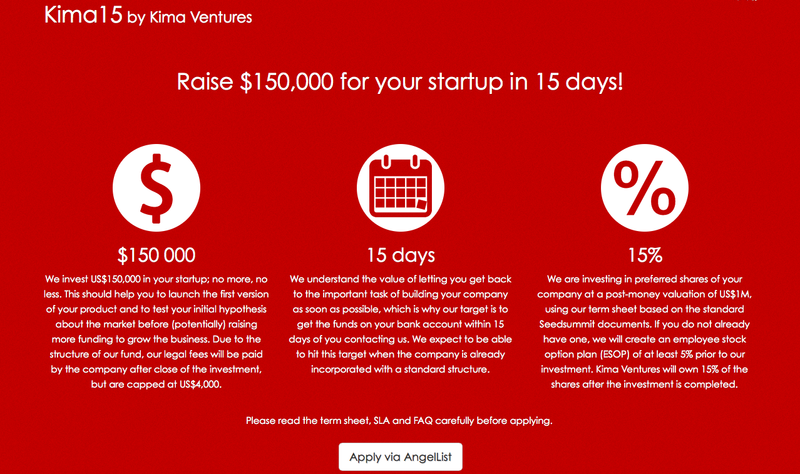 To avoid this confusion about what Kima Ventures does, we have now closed the separate Kima15 application form on AngelList and will no longer accept applications for this offer. We’ll continue to invest early and often (you can see the current portfolio and even track our evaluation pipeline in real-time) but from now on will only accept applications via our website, all via the same form (if you’re interested in $150k at $1m post, you’re still welcome to enter that on the funding question of the form). As a response to managing Kima15 and finding ways to stick to the SLA, we’ve spent the last years building more software that allows us to quickly evaluate all companies that apply for funding, this will continue to be used for all new applications and should allow us to respond to every company that contacts us very quickly, treating every company according to the Kima15 SLA. We even now offer tracking numbers to everyone who applies.